The Pyle PDWM8300 is a wireless microphone system featuring a rack mountable VHF base unit and includes eight wireless tabletop microphones. This system is the perfect for large conferences, public speaking engagements, religious events, and more. The system is also rack mountable, making it perfect for DJs who want to install it on their racks, or other users with similar set ups. This unit comes with eight microphones which are great for large performances or events. Each microphone has its own volume dial on the base unit so you can balance the vocals as desired. The PDWM8300 features a balanced XLR ouput, giving you the highest quality sound possible out of your connections. Balanced outputs give you less sound interference when using your cables so you can run them long and still get the clearest sound possible. The unit also features mixed ¼ output which lets you hook up all eight microphones to a single input on a mixer. This unit can be used in America, Europe, and other compatible countries since it features a switch that automatically changes between 110v-60hz and 240v-50hz. 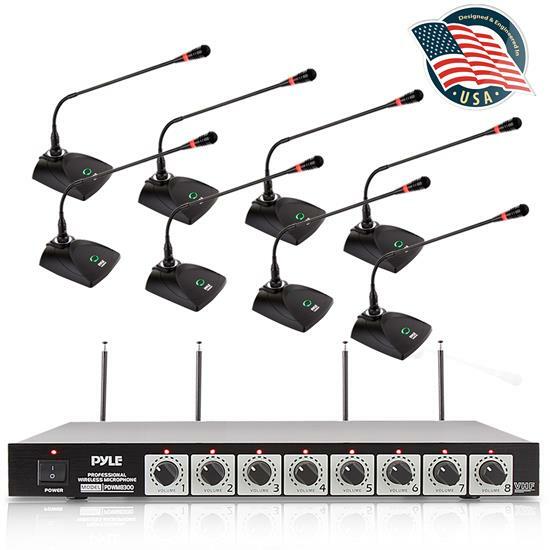 This 8-channel wireless microphone system is the kit you need to hold large teleconferences. It includes 8 tabletop microphones and a receiver with 8 inputs and dual telescoping antennas. Each antenna has its own corresponding volume control on the receiver. Outputs over mixed ¼' outputs. Operates within 50-180 meters. Runs on 110 and 220 V AC. Review : Purchased a PDWM8300 system to use in the boardroom at our facility. The system was replacing our original non wireless system that had cost a few thousand dollars and it is definitely on par as far as audio quality especially for the price. My only issue is one of the microphones only works if you are standing directly in front of the unit. Review : These mics are great. Easy to setup, and simple to use. My only complaint is that one of the microphones was bad straight out of the box. I have yet to start a warranty ticket, I will update this review after it is resolved. Review : I've only used it once sense purchased and worked great. Review : The product works well, allowing us to customize microphone volume for each microphone individually. Works much better than our omnidirectional microphones.